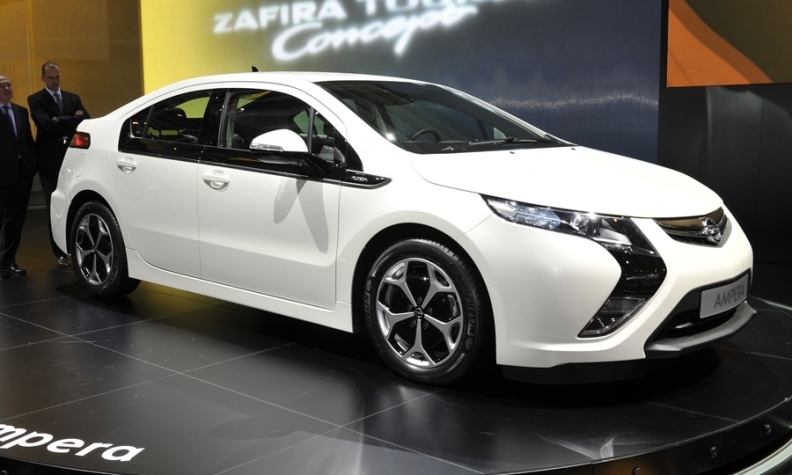 GM isn't planning European production of the first-generation Ampera. LONDON -- General Motors Co. may not make a decision on whether to build the Opel/Vauxhall Ampera plug-in hybrid car in Europe for another two years, according to the president of GM Europe. "We won't manufacturer generation one because we lose money on generation one," Nick Reilly said. This means European production may not begin before at least 2015, which is when the second-generation car will be launched, according to a company source. "We know that we're going to take a lot of cost out of generation two, out of the batteries and out of other components," said Reilly, who is also chairman of the Opel/Vauxhall supervisory board. According to Reilly, three factories are in the running for European production: "Ellesmere Port (in England) is a candidate, Gliwice (Poland) and it could be Ruesselsheim [Germany]. But we won't make that decision for maybe two more years." Last month new Opel/Vauxhall CEO Karl-Friedrich Stracke told Automotive News Europe the decision on whether to build in Europe at all will be based on the success of the range-assisted electric car, which will go on sale in November, priced 42,900 euros before grants. "We need a business case for maybe 40,000, 50,000, 60,000 vehicles a year, then maybe it makes sense to locally manufacturer it on the Continent or even in the UK," he said. The European allocation for 2012, the first year of sales, from the Hamtramk plant near Detroit in the U.S. is 10,000. Of those, 4,000 will be heading to the UK, making it the biggest market initially. Reilly said that if European production is confirmed, then the success of the car in the competing markets would influence the decision over factory location, success that could depend on the size of government grants. "It can be influenced on what the government does because if you can sell more cars in the country you're more likely to want to manufacture it there," he said. When it goes on sale in the UK, the Ampera will sell for 28,995 pounds (33,369 euros) with a 5,000 pounds grant included. So far Germany doesn't offer a grant. When the next generation car arrives in 2015, Opel is expected to offer different body styles as well. Speaking last month, Stracke said the Ampera platform had the potential to expand into different models: "It needs to have the same underbody concept, then you can put different body types on top. It could start from a B-segment car to a D-segment." Asked about specific body styles, Reilly on Wednesday replied: "It's too much a giveaway into our secrets to answer that question."